Hezbollah is preparing its army to take control of Lebanon. 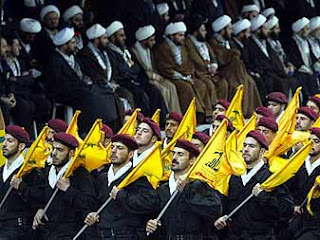 Beirut – Hezbollah has formed a 50,000-strong militia to “fight an internal dispute” if the ongoing political crisis in Lebanon was not settled, the Kuwaiti newspaper as-Siyassah reported. It also said Hezbollah has constructed 500 kilometers of roads linking its power bases in east, central and south Lebanon in preparation for such a confrontation with the March 14 forces and to enable the party confront an Israeli attack. Hezbollah has constantly sought shelter under the “resistance” umbrella that will “never” draw a drop of Lebanese blood – this latest move appears in direct contradiction of their alleged allegiance to Lebanon. The Hezbollah-led opposition have been practically occupying downtown Beirut since December 1, 2006 – with the declared objective of toppling the Lebanese government. Immediately after the start of the sit in, Hezbollah supporters threatened to storm the government compound, fenced in bared wire and protected by tanks and three army and police battalions, and remove Siniora by force. What started with ?Death to Israel” and ?Death to America?, turned into ?Death to Siniora?. While the heads of the pro-Syrian opposition, Nasrallah, Parliament Speaker Nabih Berri, and “presidency at any cost” Michel Aoun, have not once attempted to preach to their followers otherwise. It will be interesting to see how the US and the West reacts when Hezbollah makes their move. But, maybe Hezbollah will wait until a democrat sits in the White House. They know they’ll be safe to attack then. This entry was posted in Hezbollah, Islam, Lebanon. Bookmark the permalink.